In the 20th century Mount Auburn moved into a landscape style influenced by Forest Lawn Cemetery in Glendale (outside of Los Angeles, CA). 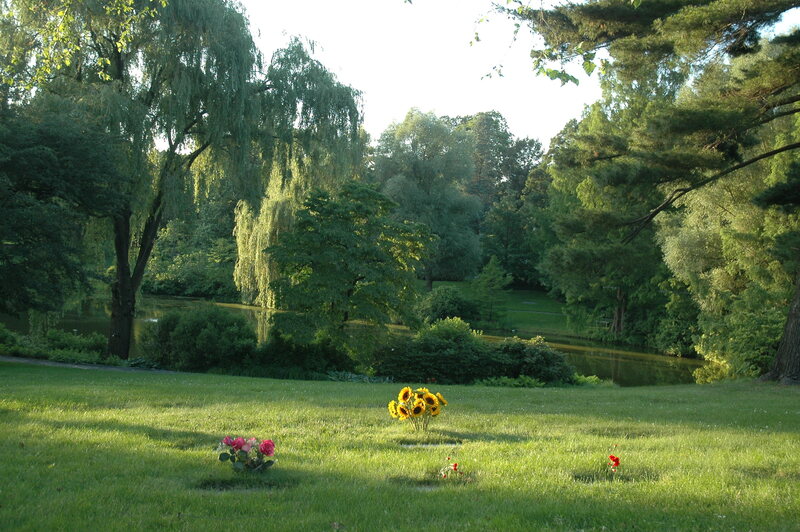 Laurence Caldwell, a landscape architect active at Mount Auburn in the 1920s and 1930s wrote that older cemeteries were “Uninteresting and repelling because of the hodge podge of objects and the monotonous view of tombstones. 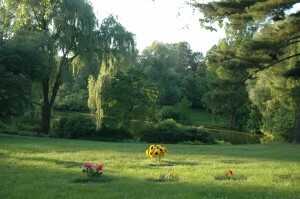 He believed “the new cemetery should become a park-like area with inspiring natural scenery carefully preserved and developed to attain a high degree of quiet dignity and peace.” These ideas were applied to the Southwest Corner of the Cemetery with Willow pond as a natural landscape focal point. The most important aspect of the memorial park concept was that individual and family monuments are taken out of the visual landscape. The markers are flush with the ground except for institutionally located monuments like the Duca Sculpture. The Willow Pond area developed in the 1920s resembles a public park. The landscape is punctuated by beautiful trees and a scattering of shrubs.